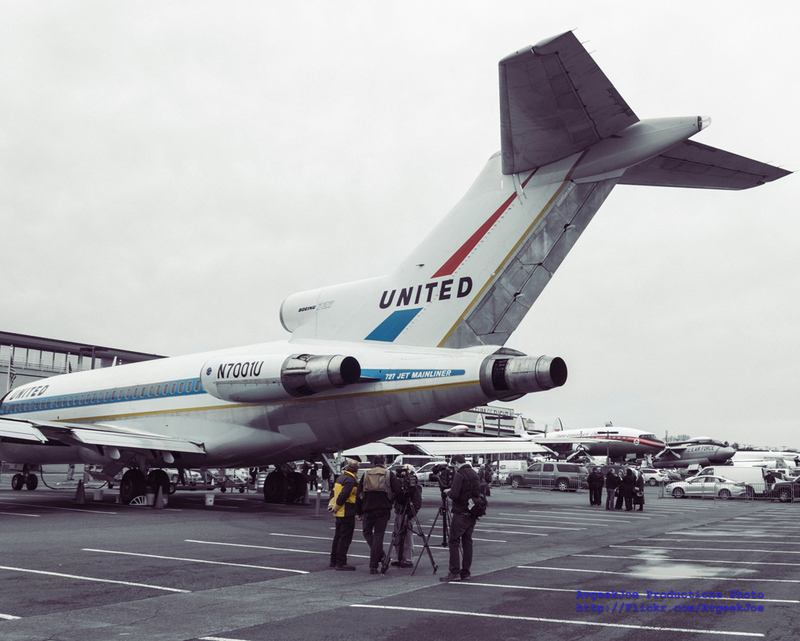 With the first-ever Boeing 727 (727-22, serial N7001U, c/n 18293/1) making its last-ever flight from restoration at Paine Field to a permanent home at the Museum of Flight, now seems like a fitting time to look back at one of the coolest airliners ever built. I recently read a presentation called Web Design: The First 100 Years, which proposed that most of what we now think of as a modern airliner was invented for the Boeing 747. That’s actually far, far more true of the 727. Although I wouldn’t want too many of them flying right over my house, I absolutely love the beautiful, capable and historic 727. What a jet! With its ability to reach into smaller airports, it worked harder to popularise convenient jet travel than its direct predecessor, the 707, ever could; and it pioneered a lot of the systems and solutions that would go on to make the 747 possible. 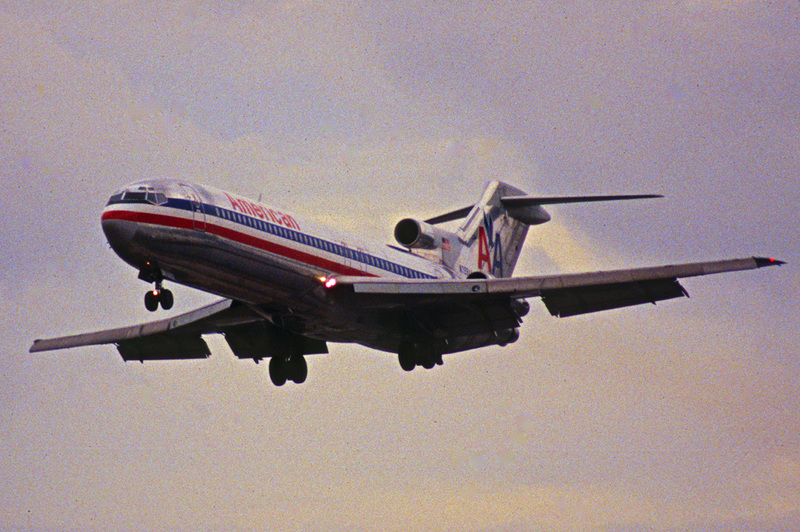 For example, the 727 was the first airliner to have an engine specifically developed for the civil market (everything before had been built for military use first); it was the first aircraft anywhere to to have a gas turbine APU; and the first to employ triple slotted flaps in a wing that opened out like a Geisha’s fan. So rather than write a traditional description of the airplane’s physical characteristics, I’d like to bring you some nuggets from that unique development story. Primarily, Boeing’s creation of the 727 is a textbook example of how to combine customer requests with industry expertise. In the end, the company developed a solution that gave seven airlines roughly what they had each asked for, but also ensured Boeing could build a profitable, sustainable and successful jet. 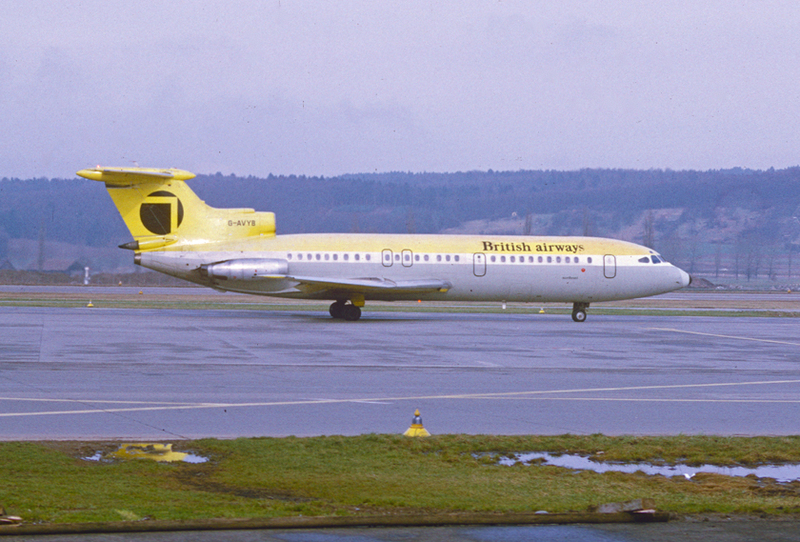 There’s no way to explore the 727’s story without acknowledging the Hawker-Siddeley Trident. And now’s an appropriate time to do that. 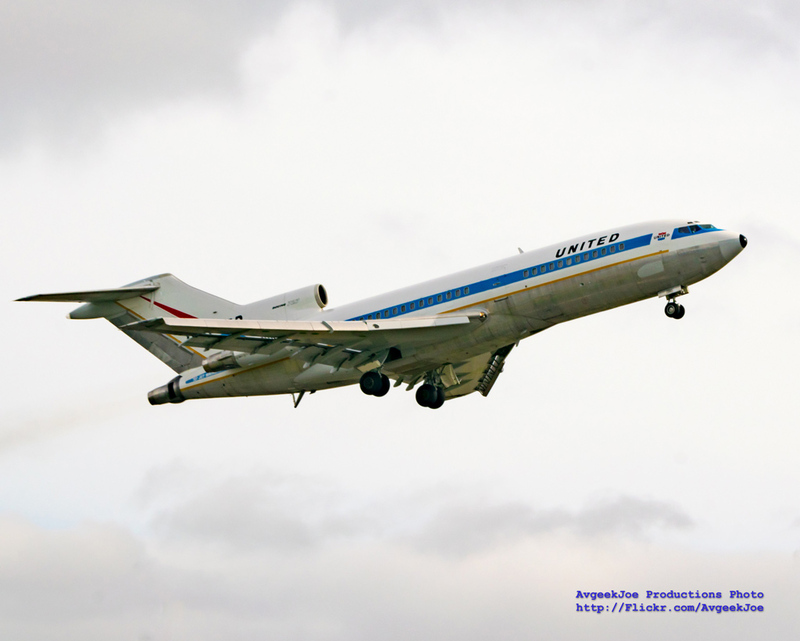 The Trident was the world’s first tri-jet airliner, and its engine layout would be repeated in the 727. Despite sharing early engineering concepts and talk of a joint venture, followed by the obvious visual similarities, the nagging allegations that Seattle “stole” the British airliner simply don’t hold water. The fundamental difference is that Boeing worked incredibly hard to align customer expectations with its own commercial needs. They were aiming to please a fistful of carriers, while safe-guarding the company’s long-term future. Hawker-Siddeley, in contrast, only had BEA as a customer. And they compromised their design by bowing to that airline’s short-sighted specifications instead of believing in the much-expanded market their jet could have created. After staring work with a survey of what their airline customers wanted from a short-haul jet, Boeing then launched an exhaustive study into the potential configurations and their respective merits. 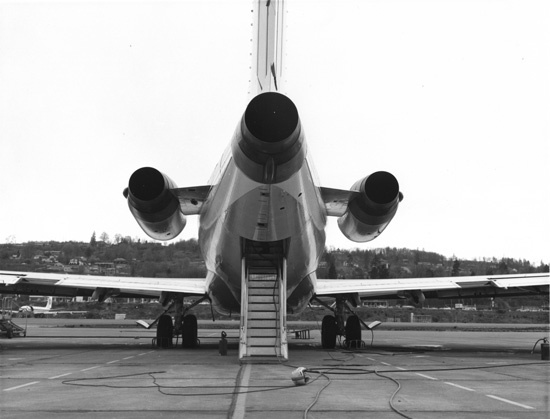 VC10 vision: Four aft-mounted engines, but no T-tail. Design project 272-474. This included more than a hundred designs for two- and four-engined layouts featuring twin rear-mounted engines, Boeing’s proven underwing pods, and more. 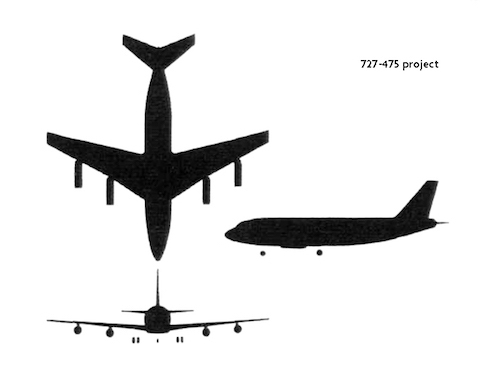 Each project was labelled ‘727-ABB’, where A was the number of engines and BB was the number of the study. 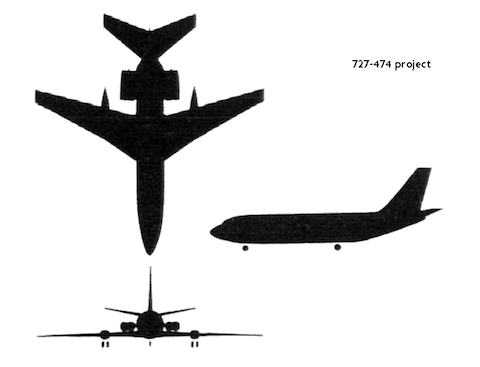 For example, 727-474 was the 74th design study for a four-engine layout. it) too high for a civil jet. A true ‘Baby Boeing’: Four wing-mounted engines. 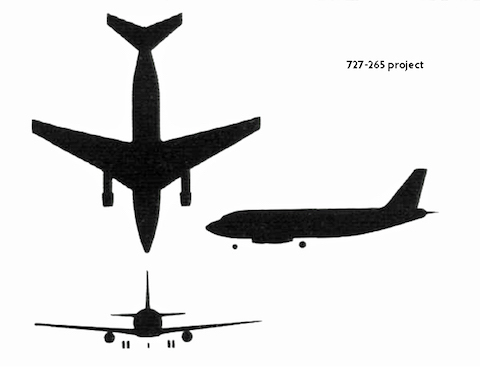 Design project 727-475. One of the two-engined configurations, project number 727-265, looked remarkably like the first generation 737s that would follow. A far stronger front runner was simply a small version of the 720, which was itself a ‘baby’ 707 with four underwing engines. However a study of operating costs, modelled on shorter route sectors and airports that had previously only been served by prop-liners, showed that three engines would offer an 8% saving in direct operating costs over four, while still delivering the required landing and takeoff performance. At a stroke, four engines were off the table..
A twin configuration was next to go. The airlines realised that FAA weather minima, which were still aligned to prop-liner performance and accounted for an engine failure on take-off, would limit a twin to the far more restrictive IFR conditions applied to singles. This would make the new jet a source of inevitable delays every time the cloud ceiling dropped below 300 feet. An extra engine would buy them another 100 feet of inclemency. Boeing actually took a whole year’s weather data from Idlewild Airport (now JFK) and painstakingly correlated it to one airline’s 11,041 scheduled New York departures over a year. They then worked out all the weather delays that their two- and three-engined designs would suffer in service. This enabled them to declare, with the confidence 11,000+ data points bestows, that a twin would experience 221 weather delays of two hours or more per year, while a three-engined jet would only be delayed 38 times – a staggering difference of 183 very late departures and all their knock-on effects. Placement of the other two engines was an open question. The engineers weren’t that worried about the concept of a ‘clean wing’ and its high speed/low drag benefits. They’d found that nacelle pods and underwing pods created about the same amount of drag, while underwing pods helped limit spanwise flow, which made it easier to control the stall without over-wing fences. One option was to put the engines in pods above the wing’s trailing edge, where they effectively reduced drag by acting as anti-shock bodies. Unfortunately they were just as effective at inducing flutter, and the idea was abandoned. The inevitability of aft-mounted engines rapidly gained momentum. With little difference in terms of aerodynamics, the decision was swayed by the aft mounted engines being higher (i.e. safer from ground scraping and dirt ingestion); having a slightly lower installed weight; creating a quieter cabin; and allowing the fuselage to be slung lower, for easier access by ground services. More importantly though, the final clean-wing configuration gave designers the freedom to build an incredible flap system that paired low speed, short field performance with a high speed cruise. It meant the 727 would become the perfect small airliner, bringing the comfort, performance and flexibility of jets to hundreds of new destinations and millions of potential passengers. 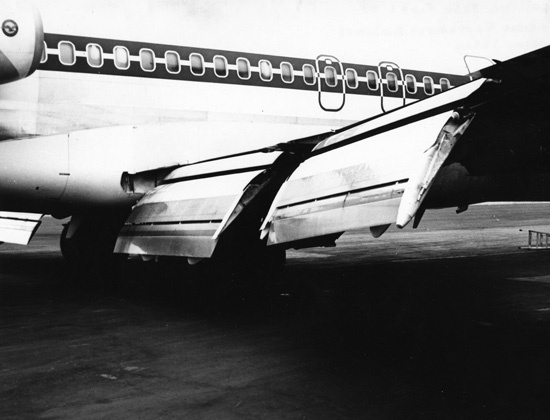 The flaps were a first for airliners – triple slotted main flaps, plus leading edge slots and Kruger flaps. In early development, all the flaps and flap tracks incorporated blowing (using bleed air from the engines) to improve boundary layer control. Blowing wasn’t incorporated in the end, but the final, unblown flap system still delivered a lift coefficient of 2.8 (against an original design goal of 2.0), while the clean, cruising wing had a CL of 1.25. In other words, the maximum lift coefficient was 2.24 times the clean wing CL. Back in the day, those flaps were a source of fascination for plane spotters and passengers with a view of the wing. It’s reasonably normal now, but watching the 727’s wings unpack themselves to reveal the central box as the only solid part of the whole affair must have come as quite a shock. The final element in Boeing’s exciting new package was its powerplant. The success of the 707, and the evolution of turbine technology, had created a world where it was at last viable to develop a turbofan engine specifically for civil jets. Initially, Boeing was designing around the 12,750lb dry thrust Rolls-Royce Spey, built under license by Allison as the AR963. But in 1960, well into the 727’s development, Pratt & Whitney offered their new low-bypass JT8D-1, with 14,000lb thrust, but a 1,000lb weight penalty. Whatever late night phone calls took place next will likely remain a mystery, but Eastern Airlines chairman Eddie Rickenbacker was soon in contact with Boeing to declare that Eastern preferred the JT8D. Pratt & Whitney’s new jet swiftly became an option, and then the only power plant, for the 727. All three engines would have “clamshell door” thrust reversers to help with short field landings. The outboard reversers exhausted vertically, while the No.2 engine’s exhausted horizontally just aft of the tail fin. That middle engine was hung from one central beam, with access from hinged cowl doors on either side of the aircraft, meeting at the lower centreline. 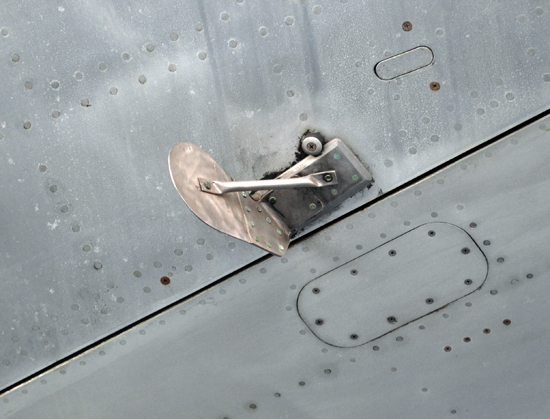 The hinge pins were easily removed, so the cowls could be taken right off for ease of maintenance. Each aircraft also carried a special portable hoist, which could be used for changing the No.2 engine if proper ground equipment wasn’t available..
That thinking about smaller fields and their limited facilities was central to the 727 design philosophy. It led to the legendary ventral staircase, removing the need for terminal air-stairs. Eastern opted for a self-contained front stair as well, which folded away under the main cabin floor of their jets. There was also the novel gas turbine APU, which provided the 727 with self-contained ground power and main engine starting. The APU itself was mounted under the main cabin, through an opening in the web of the keel beam, and had an exhaust port in the upper surface of the wing. Access was from the main wheel bay. Another innovation was single-point refuelling, which reduced turnaround times to make the 727 an even more profitable workhorse. 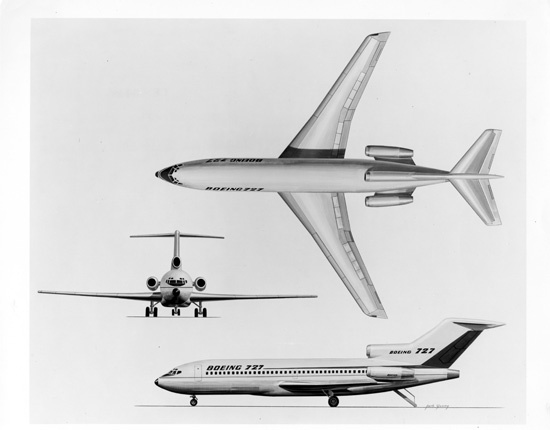 But for so much new and detailed thinking, the development of the 727 was remarkably quick. (Suspiciously quick, the Trident defenders still claim.) With the configuration questions finally settled, the design was finalised on September 18th, 1959. The finished airplane would be making money in little over four years. 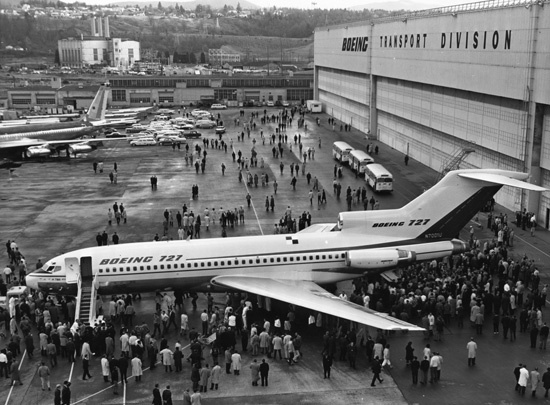 N7001U rolled out of Boeing’s Renton plant on November 27th, 1962 and first flew on February 9th, 1962. Deliveries to Eastern Airlines began on October 29th, 1963; certification followed on December 24th; and the first revenue service was flown on February 4th, 1964. One hidden change was the installation of vortex generators inside the No.2 engine inlet duct, after disturbed flow caused engine surges early in N7001’s test program. And by ‘early’, I mean right after rotation on that first flight. In addition, the actuators for the leading edge flaps and slats were insufficient for the air loads generated in flight. Those devices had to be left deployed for the entire first flight, and the actuation system redesigned. 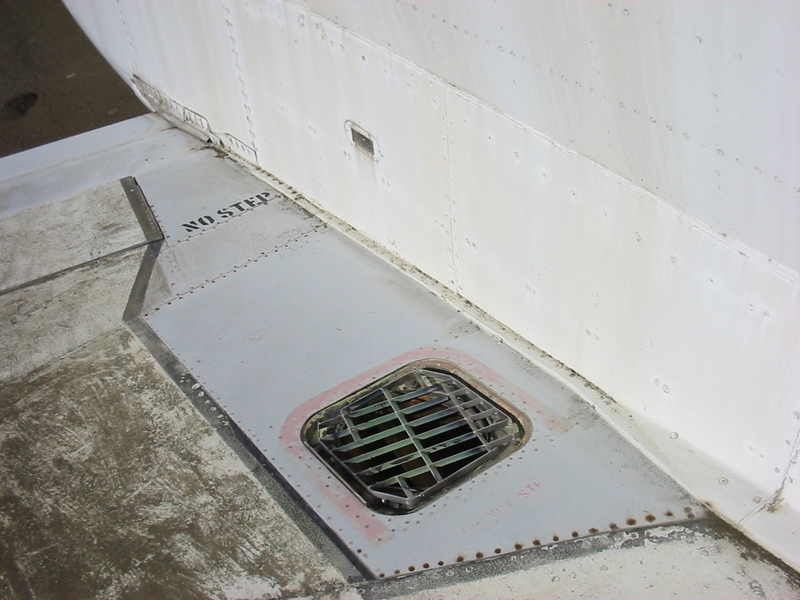 But my favourite 727 detail is the ‘Cooper Flap’, a small aerodynamic tab that locks the ventral stair during flight – retro-fitted from 1972 to prevent a repeat of “Dan Cooper”’s famed post-hijack parachute escape. Not too many people notice that unusual feature. Even admitting to my own heavy bias, the 727 was, and remains, a triumph. It redefined air travel and would become the most successful airliner ever, until eventually overtaken by the 737 – a design that benefitted in every way from the 727’s story. Aircraft No.1, N7001U, would fly with United Airlines until October 1988, four years after 727 production ceased at 1,832 airliners. It was certainly the greatest example of a manufacturer telling airlines what they actually wanted, instead of what they thought they wanted, since Donald Douglas sold TWA a twin-engined airliner instead of the three-engined anachronism they asked for. That kind of intelligent response is clearly how legends are made. As a final bonus, here’s a rain-drenched look at N7001U before its restoration, posted by Ryan Bomar in March 2014. 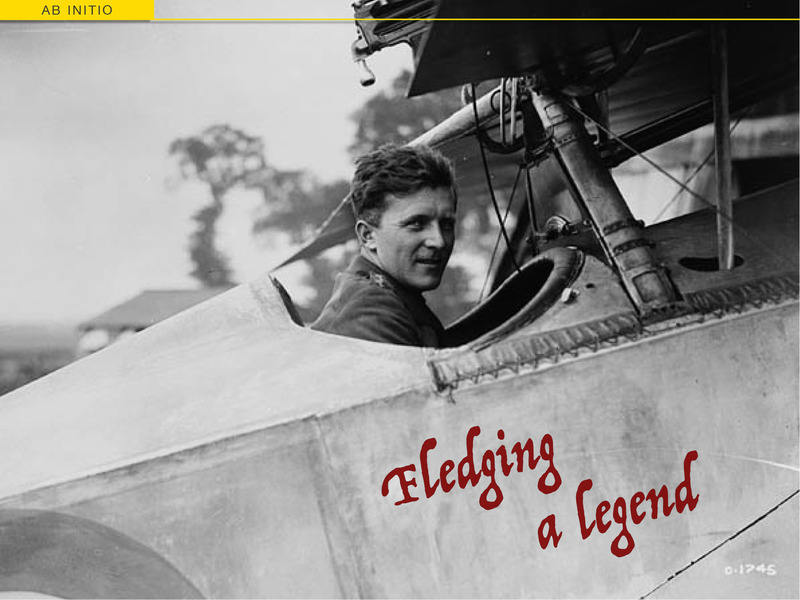 A fine tribute to a legendary aircraft! I had seen Bogash’s site and was amazed to learn not only that they repainted the airplane outdoors, but that it was done with ordinary household paint rollers rather than spray guns. I guess sometimes the simple methods are best. The 727 already had a fascinating history, but the restoration and final flight of this serial number add the perfect final note. It’s hard to imagine most airplanes holding up so well if they were parked outside in the salt air and coastal Pacific Northwest weather for decades like this airplane was. I wonder when the last flight of a 737 will take place. I’m guessing it’ll be 2050 or beyond. I wouldn’t be surprised to see the 737 line hit the 100-years-in-service mark at some point. Will an Airbus ever serve that long? I doubt it. Well, I try not to pick sides… but Boeing have really reminded us that building planes is engineering. That 727 is one tough bird; it’s nice to see it preserved. I exchanged emails with Bob Bogash, so it was nice to congratulate him and his team directly. And to say “thanks”. The 727 is such a great plane and the final of flight of N7001U seems like a fitting way to wrap up the story – although I’m sure her sisters will keep earning a living somewhere in the world for years yet. As for the 737 – its story is very much still being written. It may be a bold call on my part, but I don’t think the DC3 should get TOO used to wearing that ‘Greatest Airliner Ever’ crown. I spent a lot of hours strapped in these tubes 7 miles above the earth. 🙂 Did it get old after a while?